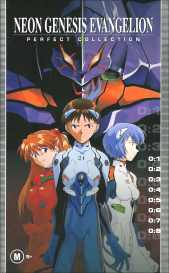 Comprising of 8 DVDs, this beautiful boxed set from The AV Channel gathers up all 26 Episodes of Neon Genesis Evangelion in a collectable format. Created by the NERV Agency, the Evangelions are a bio-mechanical answer to Earth's only hope in the future when aliens known only as the Angels decimate roughly half the world population. The Angels hold the Earth in check through a force field called an absolute terror field. The Evangelions are the only force on Earth that can make it through the fields and attack the Angels directly. Humanoid in shape, the Evangelions are piloted by young children who were all born nine months after the initial meteor attack by the Angels took place. The series revolves around evolution, God and morality and raises extremely thought provoking questions. I found the series to be fascinating viewing. From a DVD perspective, this title is perfectly suited for the format with clear crisp picture and hardly any mpeg artifacts at all. Whilst taking advantage of Dolby Digital, the series only uses 2 channel stereo. The quality of sound is great but I would have loved for the discs to take advantage of full 5.1 surround. That would have blown viewers away. The quality of the animation and artwork in general is superb whilst the gigantic battles that take place will take your breath away with their savagery and brilliant colouring. The storyline for Neon Genesis is unlike any other I have watched before with character development being taken to new levels to the point that you will feel as though you know the characters and will laugh and weep with them as the storyline progresses. Neon Genesis Evangelion: Perfect Collection is exactly that, perfect. It is the collection of one of the finest most thought provoking anime I have watched and in my opinion is a must have addition to your DVD collection. For those that may scoff at animation, I dare you to watch this series with an open mind, you will be pleasantly surprised!